Please select the overall length your bed needs to be to fit into the space you have available in your room. 'Colour' has been set as 'white'. If you would like a different highlight colour, please use the colour selection box. We cannot modify the width of Stompa beds. The width of your bed will be 98cm (+29cm for the steps). You then have the option to choose between 2 types of mattress and a wide range of underbed furniture and accessories to complement your bed. These items can be selected from the related products box, located below the main image. Option 1 - To keep the pull out desk and keep the 4 drawer chest on the end of the bed, remove the 4 cube unit. Option 2 - To keep the pull out desk but not the 4 drawer chest on the end, you could keep the 4 cube unit and overlap the 2 cubes nearest to the ladder behind the back of the ladder. This would leave the 2 cubes furthest from the ladder free of obstruction, and you could put 2 doors on these 2 cubes (one above the other). 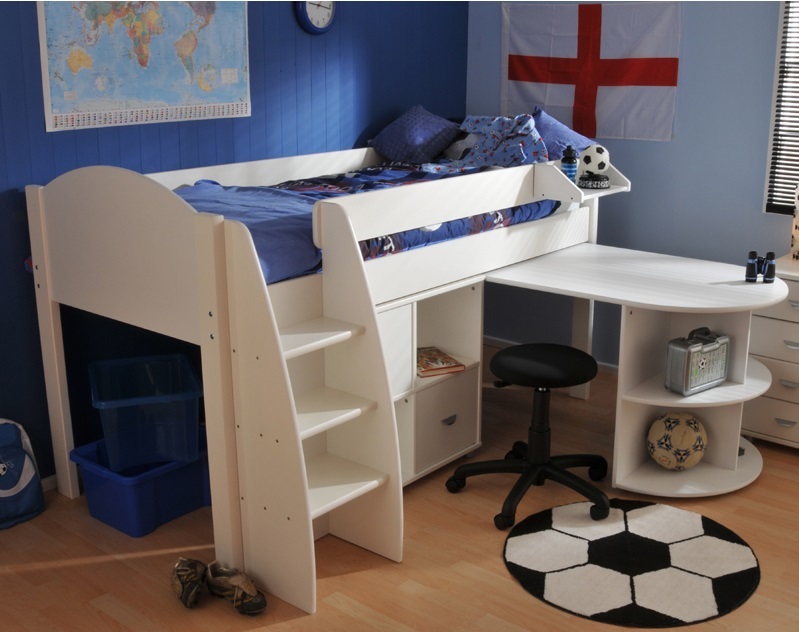 There is not sufficient room to position the 4 drawer chest between the desk and the ladder. Option 3 - a popular arrangement where no desk is required is to place a 4 drawer chest and 4 cube unit side by side, with the 4 cube unit spanning behind the back of the ladder. This creates a 'wall' of storage down one side of the bed. Option 4 - If the end of the bed can be accessed, put a 4 drw chest or 4 cube unit accross the end of the bed and another chest or 4 cube unit in the space between ladder and leg. This will usually leave a crawl space by the side of the ladder for a young child to access the underbed 'den' space. I had the bed shortened to fit a standard British 6'3" mattress but you would never know as made to a very high standard. The bed is sturdy and a good height and my boy (he previously co-slept with me) is in it happily most nights. The ladder has 3 solid steps so he can climb up and down safely. I also purchased the drinks shelf and bunk light which matches the bed and is very good quality. The service was excellent with delivery as stated within 3 weeks of ordering. I fully recommend opting for assembly if you can. Bed was built in an hour hassle free and all rubbish removed. All round five star service. Thank you. This bed is brilliant! Ordered for our daughter's very small awkward bedroom. It's really high quality, easy to put together and solid. Customer service was amazing throughout - they even cut a length off the back legs of the bed so we could place it on top of boxed in pipes and push the bed right up against the back wall - so important in a small room. And they allowed us to buy a spare set of regular length legs so that the bed is useable if we move or decide to sell it at a later date. Given an estimated delivery hour too. Nothing was too much trouble. Brilliant all around. This mid sleeper cabin bed is perfect! It's solid, good quality wood and we went for the 187cm for ourv 3yr old daughters box room and it's perfect. We only had 1cm spare either side, knew we'd have had no chance putting it together with our limited skills and patience so opted for the delivery (to Kent) and assembly to be included. Colin is a magician as he assembled it in the very tight space in no time! Excellent customer care and we bought the custom made to measure mattress too. VERY happy customers - both parents and our little girl!